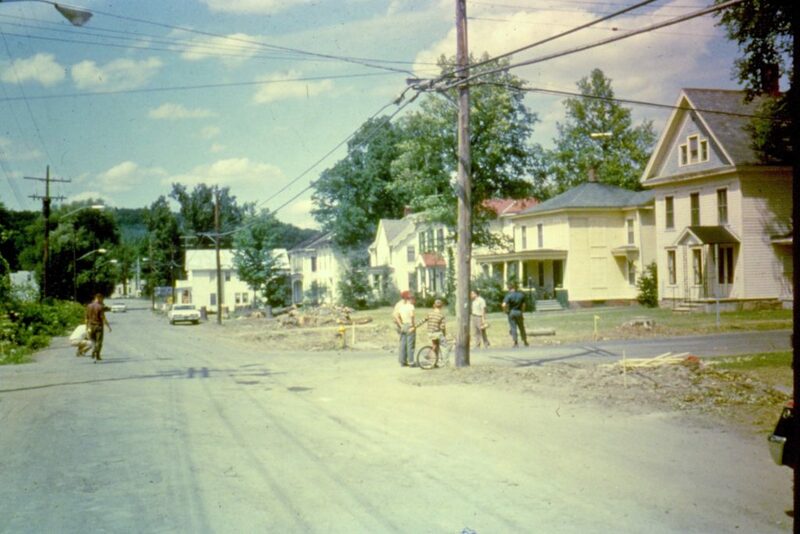 The photos in the following photo gallery were taken by Mr. Bill Avery during the summer of 1964. 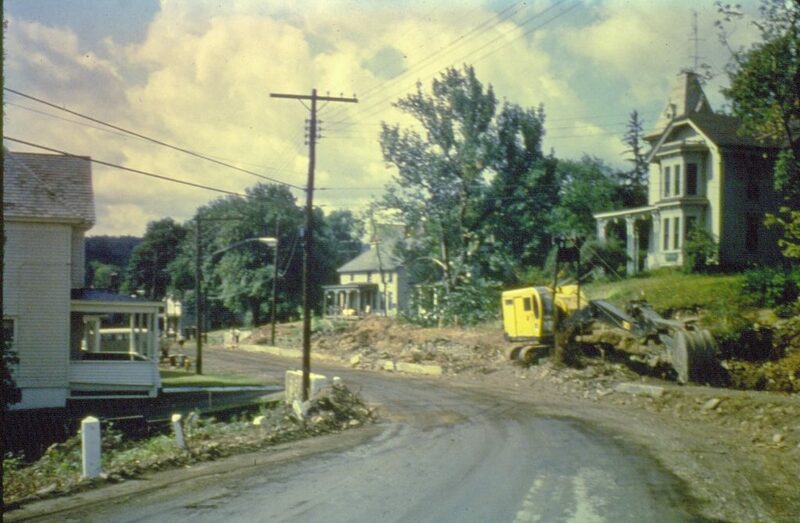 These photos provide a historic look at the destruction that took place in the Village during that year. Surely it must of been awful to live in the Village during that time. There was much opposition to the new road. 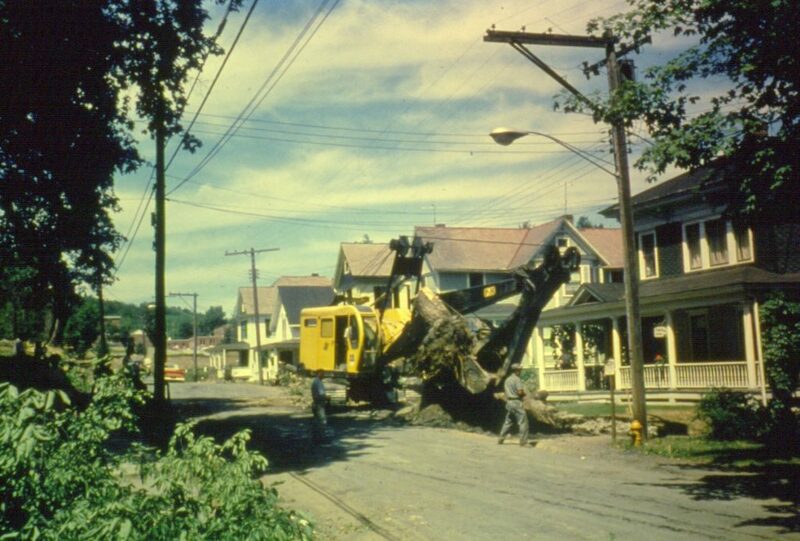 The beautiful big trees that lined the old road were taken down, the road widened with shoulders and gutters along the road with frontage of homes taken and buildings taken down or moved to accomplish this. 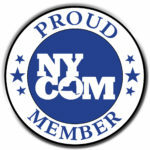 One well known out spoken citizen was Mr Robert Shafer. 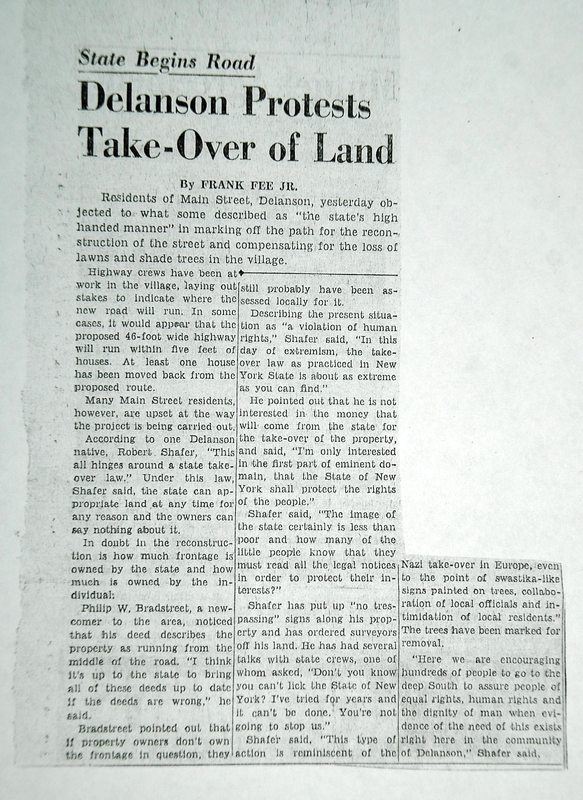 In the following article Mr. Shafer expresses his outrage. 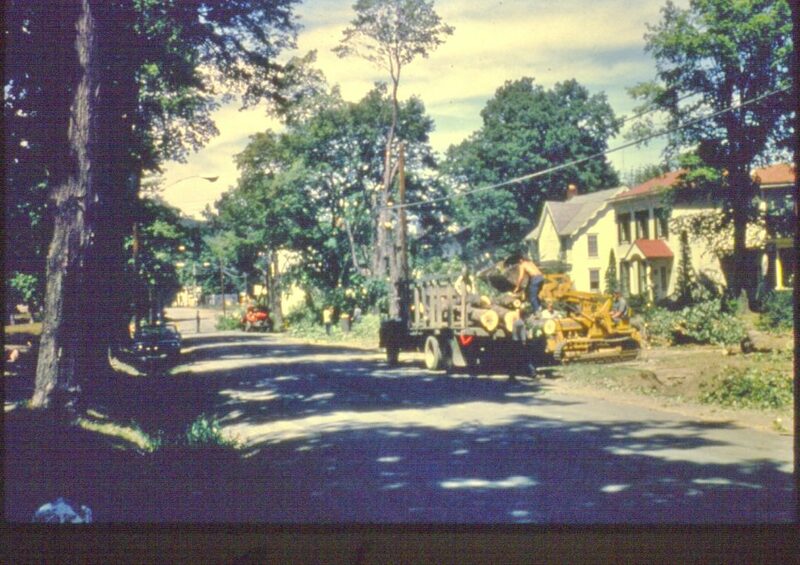 A special thanks to Mr. Al Zubal for providing these photos to the village for use on our website and to Lenny & Pat VanBuren for use of their 1964 Delanson Roadway Improvement Program notes. 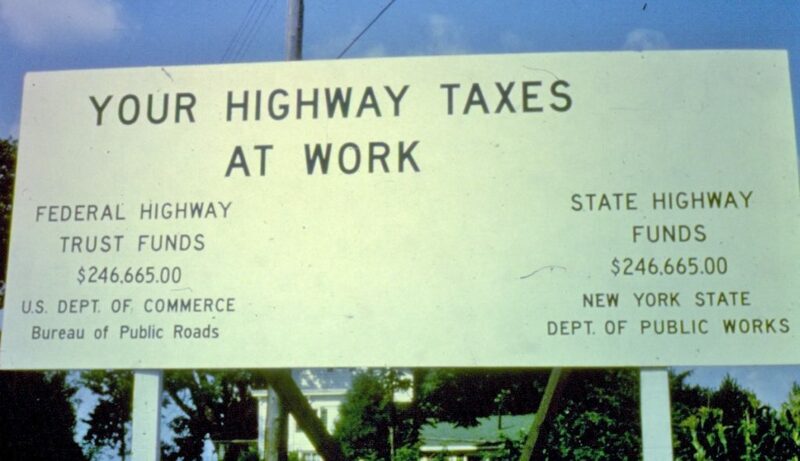 Your Highway Taxes at Work. Hard to imagine they could do all this for a little more than a half a million dollars. Today that sign would cost half a million $! 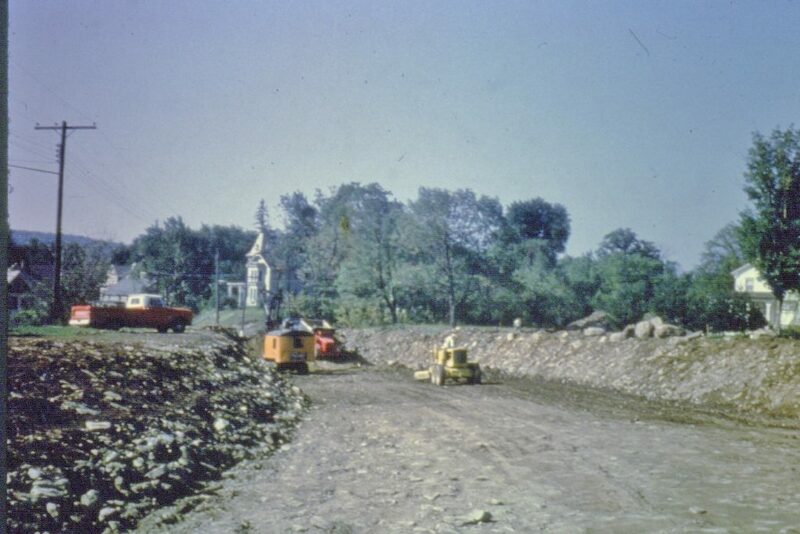 The new route 395 being constructed. 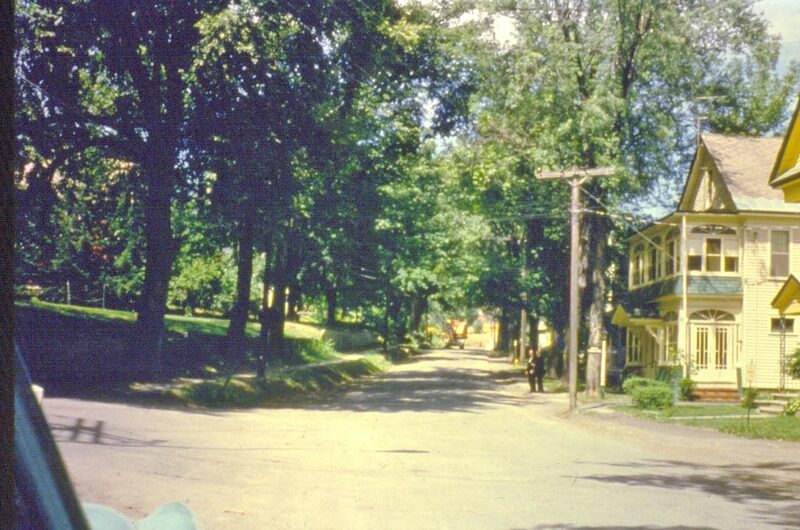 This view is looking north from Quaker Street down to the VIllage. 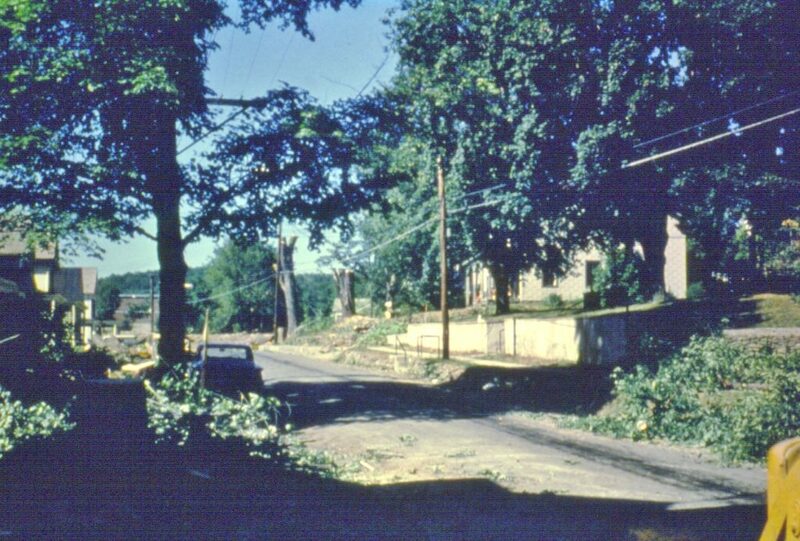 You can see the Methodist Church in the upper right. Further down the hill still looking north at South Main Street in the Village. 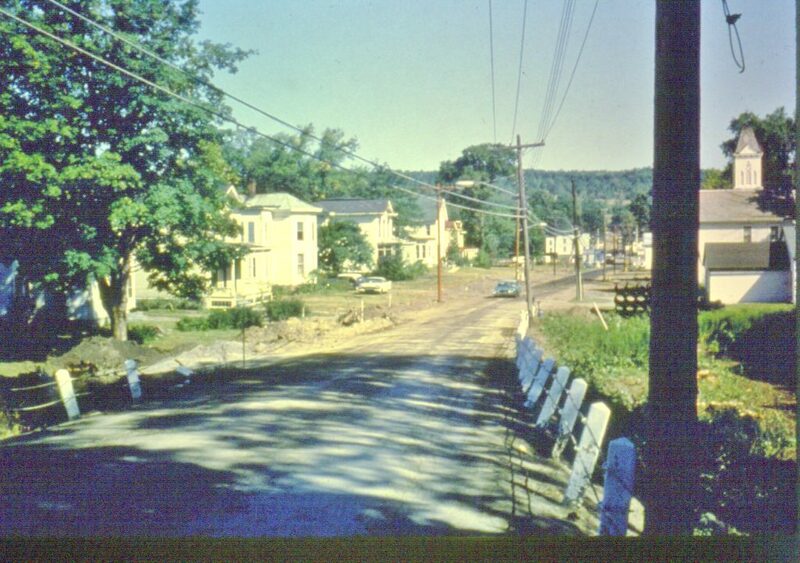 Looking north on South Main Street at the corner of East and West Shore Roads. Standing in front of the Telephone Company building. 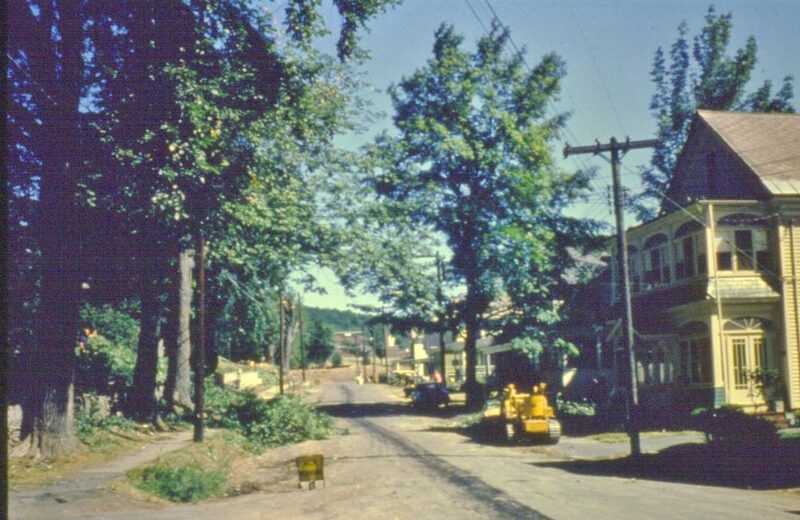 Same location as the previous photo before the trees were removed. 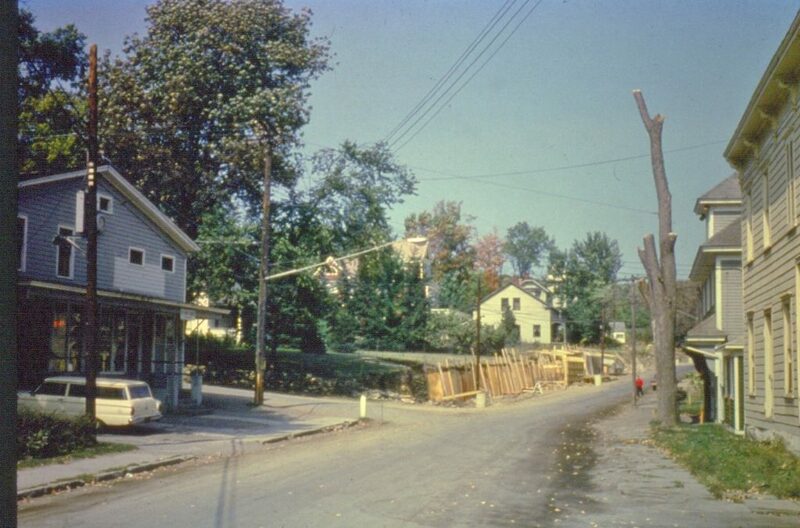 South Main Street looking northeast at the Zubal home and Dr. Hinsdale's office. 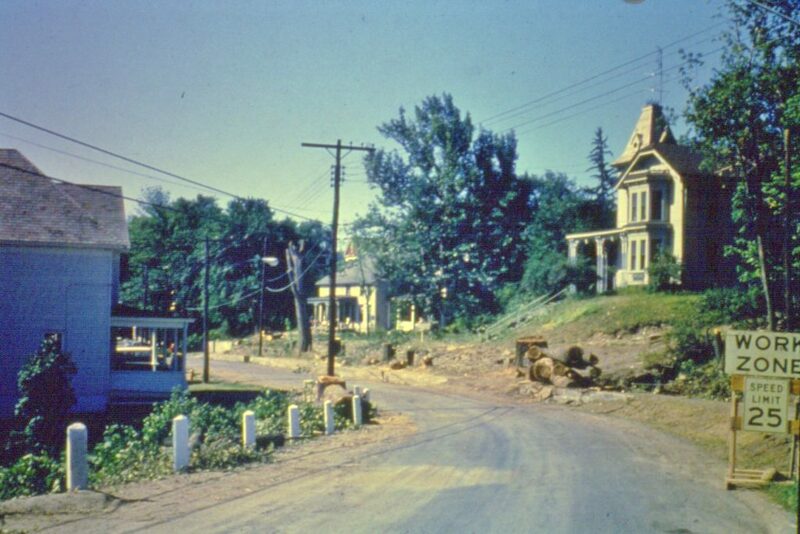 Same location as previous photo but standing in the intersection of East and West Shore Rds and Main Street. 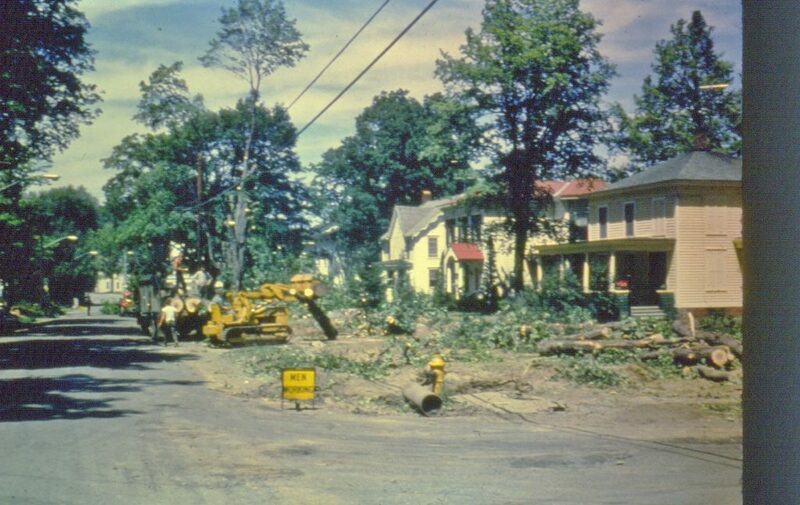 Same location with the trees removed. 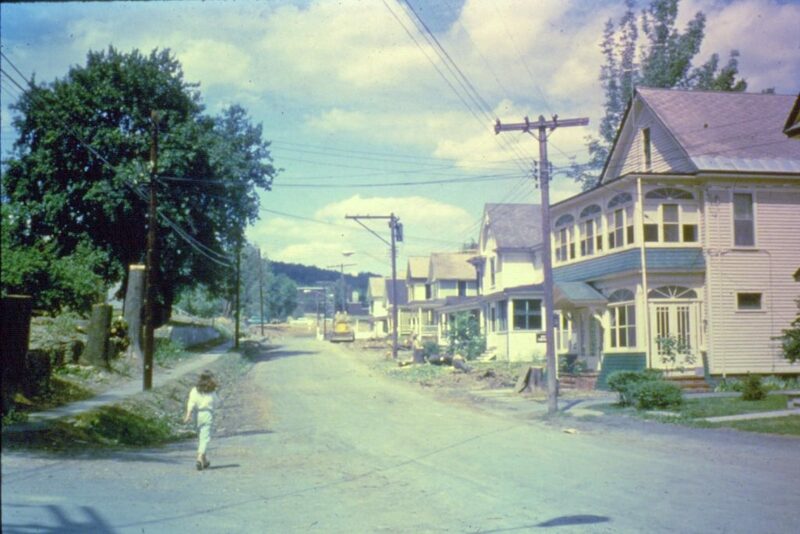 Here you can see the Drinon house, currently the Mackie home at the far right. Standing in front of the Methodist Church. Still looking north further up Main Street just before the R.R. Crossing. Standing in front of currently the Gifford residence. Just before the R.R. Crossing was English's Market. It straddled the Normans Kill Creek. 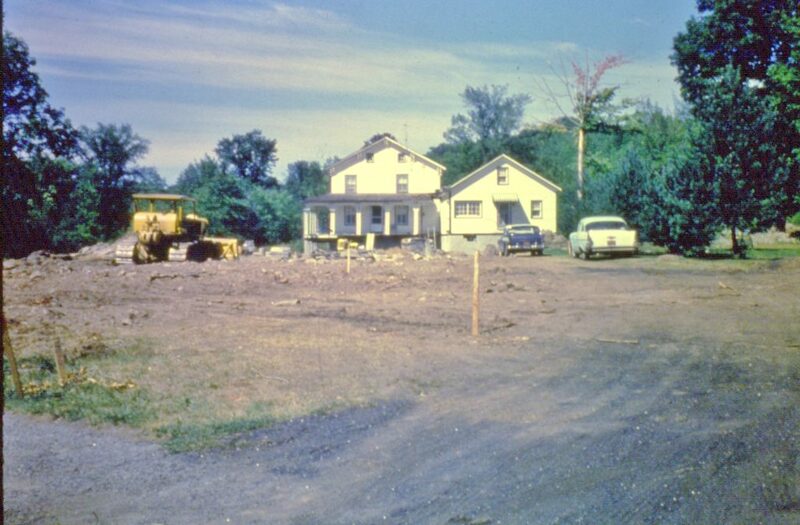 Hard to imagine they would build a house over a creek. Talk about a wet basement! Same location as the previous photo but English's Market has been removed. 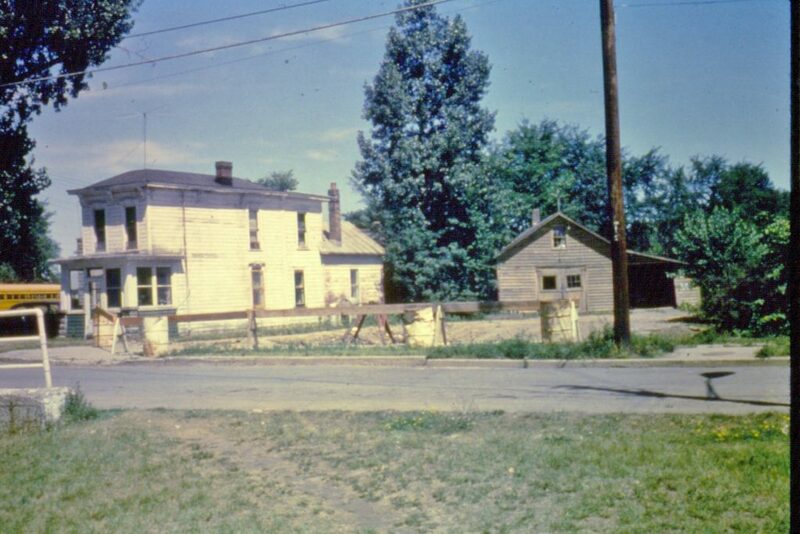 Notice the old Railroad house that was still standing. 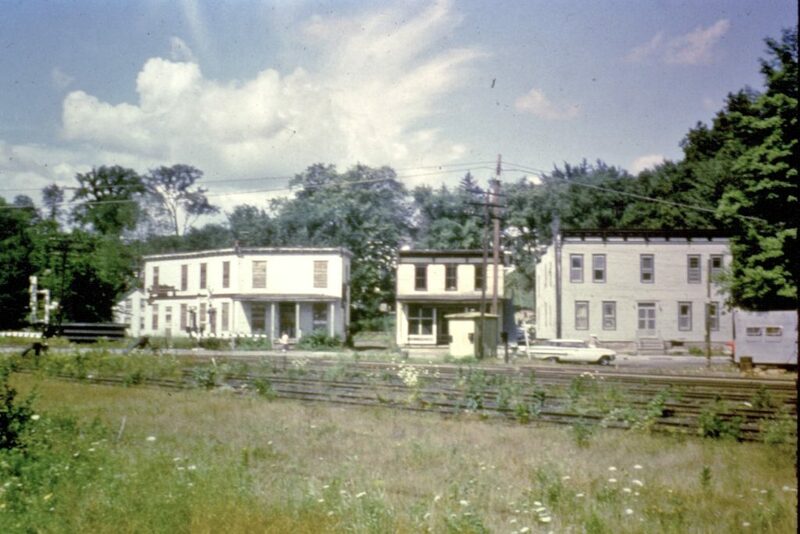 Looking west at North Main just over the RR tracks from left to right was the Shoudy House, Dobert's Store and the Central House Hotel. 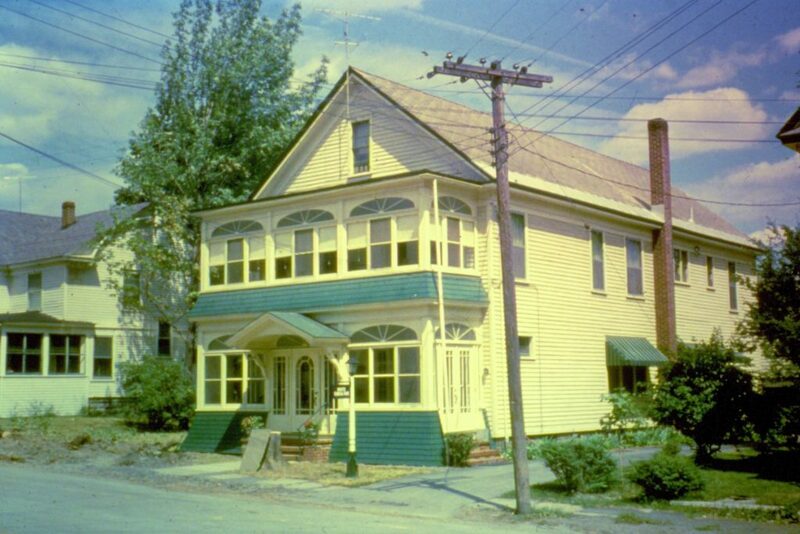 A view of the Shoudy House before demolition. 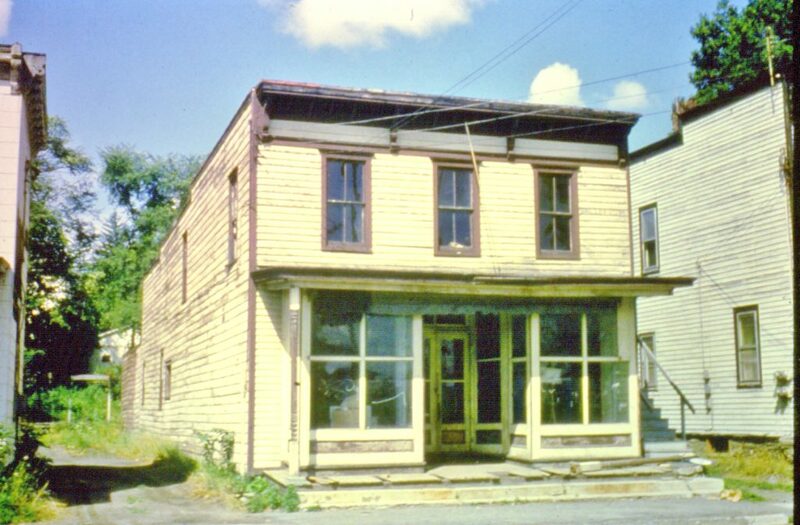 A view of Dobert's Store before demolition. 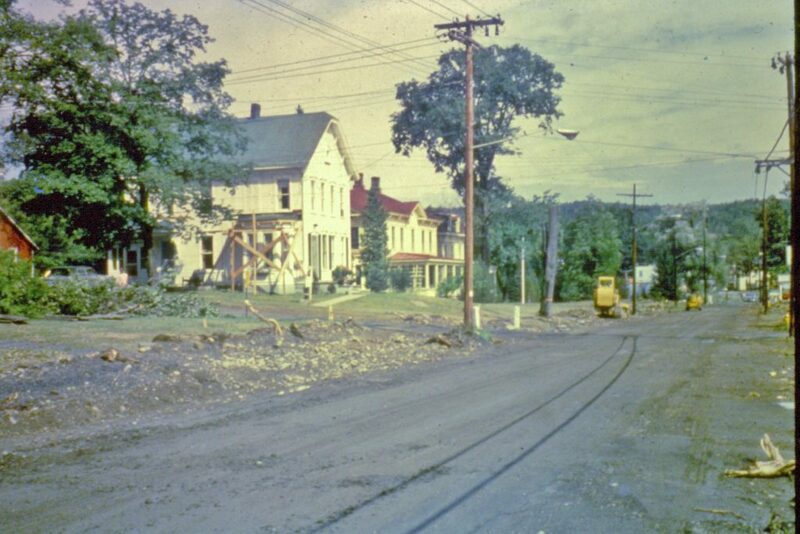 A view of the Central House Hotel after the Shoudy and Dobert's were demolished. 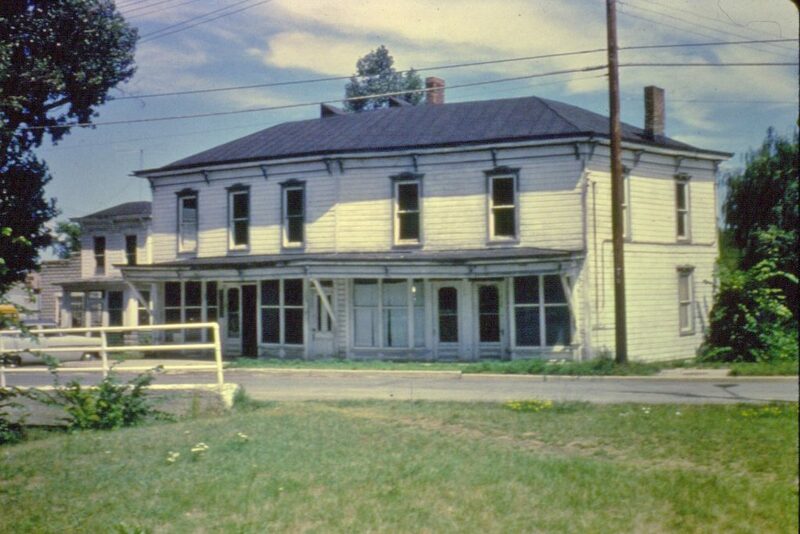 Another view of the Central House before being razed. 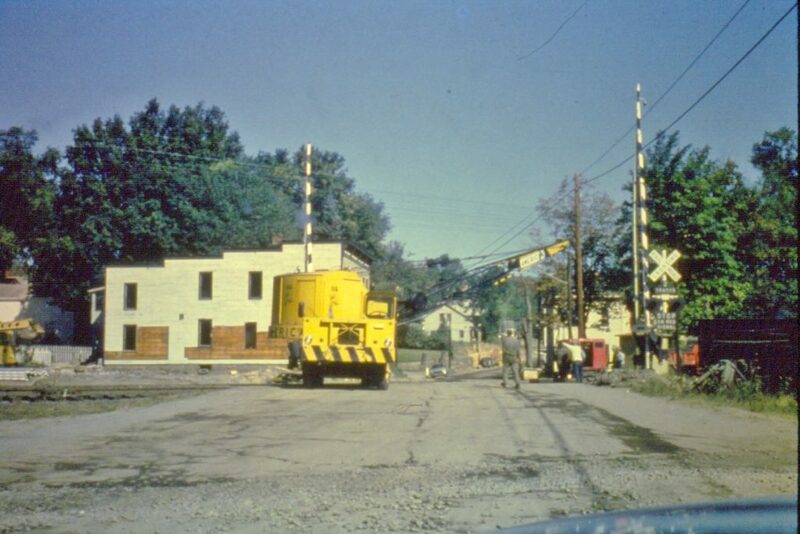 Looking north on North Main St. at the intersection of Maple Ave (currently Thousand Acre Rd. 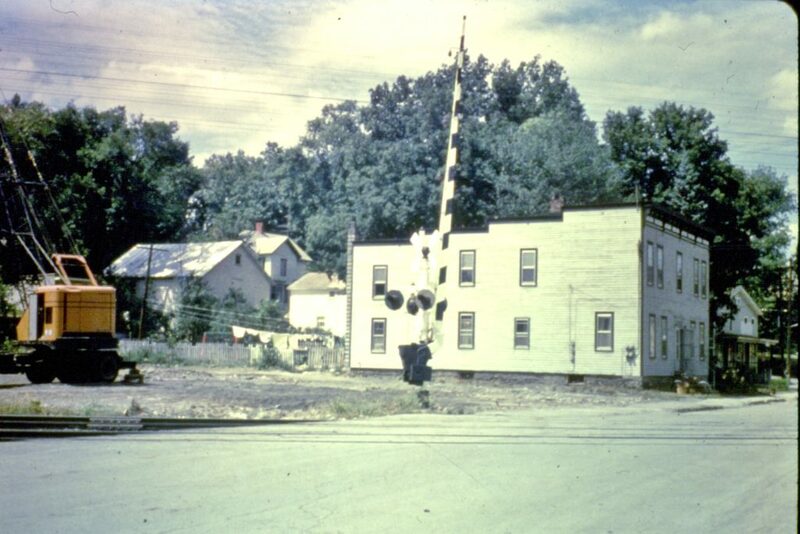 The Post Office and Carroll's Store on the left. 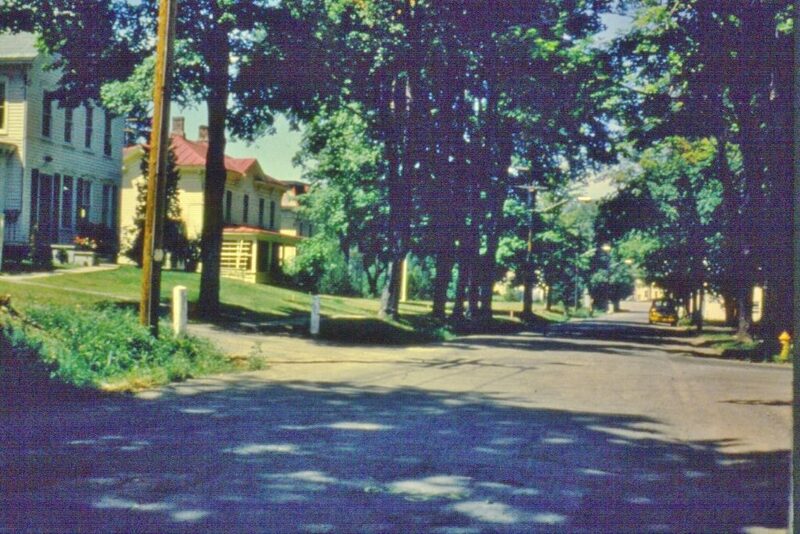 Florence Jackson's house on the right. 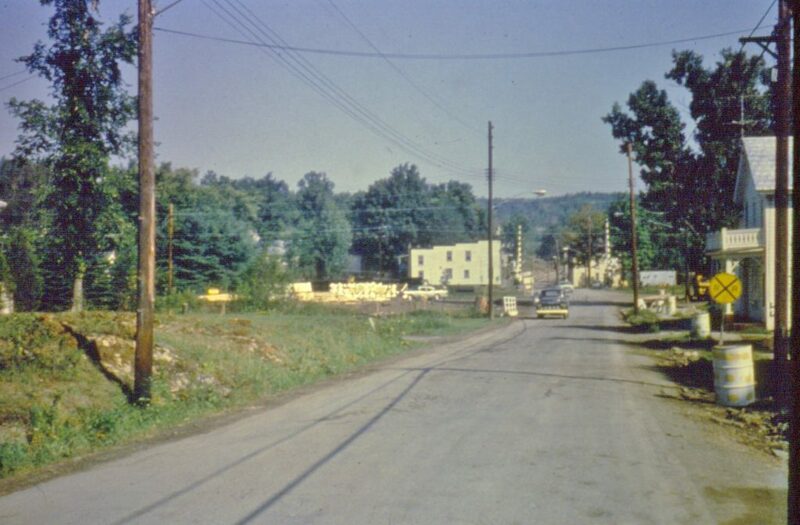 At the intersection of Thousand Acre Rd looking north up Main Street. 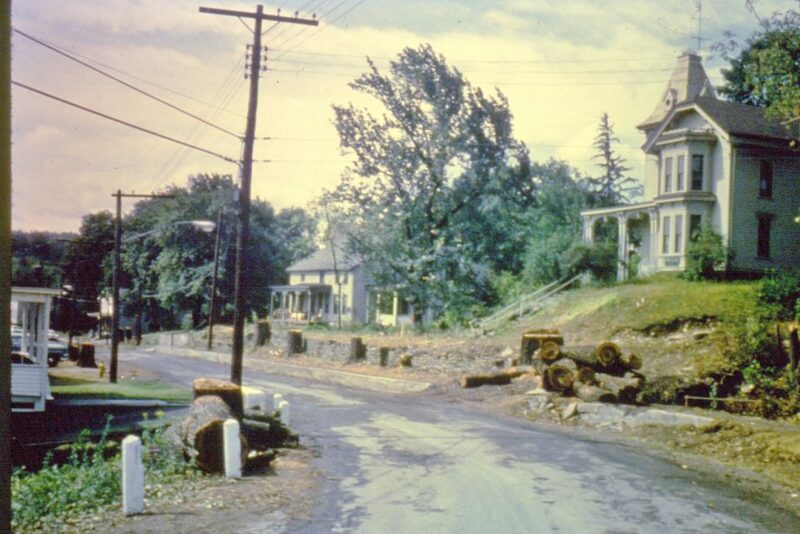 White VanBuren Funeral Home on right before trees are removed. 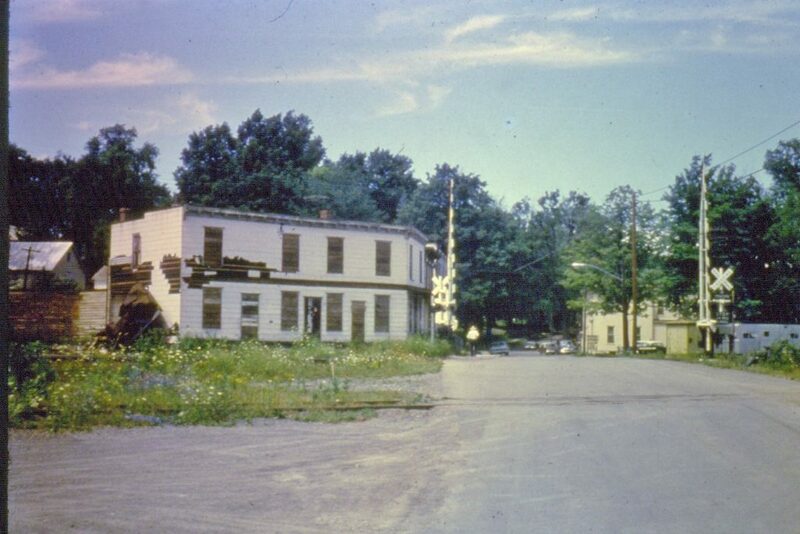 The White VanBuren Funeral Home in 1964. Same view as previous photo during tree removal. Looking north on North Main. Getting ready to remove a tree stump in front of the Meyers home. 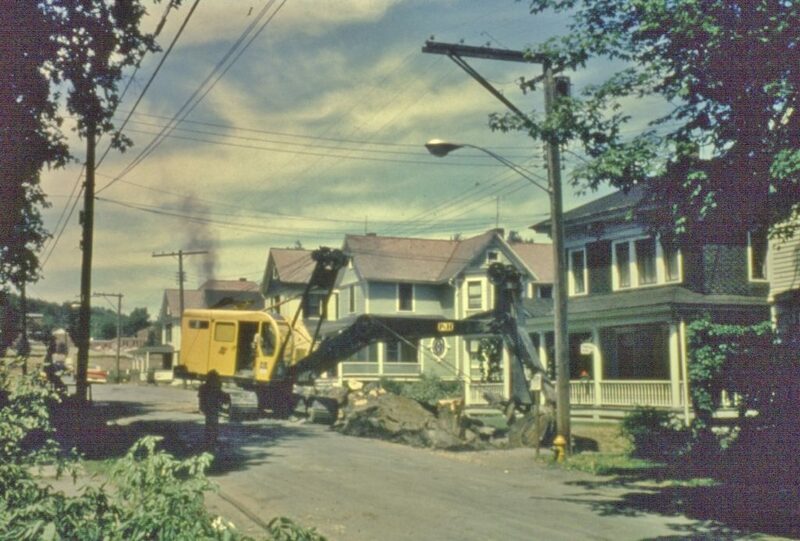 Pulling a tree stump out in front of the Meyers home on North Main Street. You can see the H.S in the background. 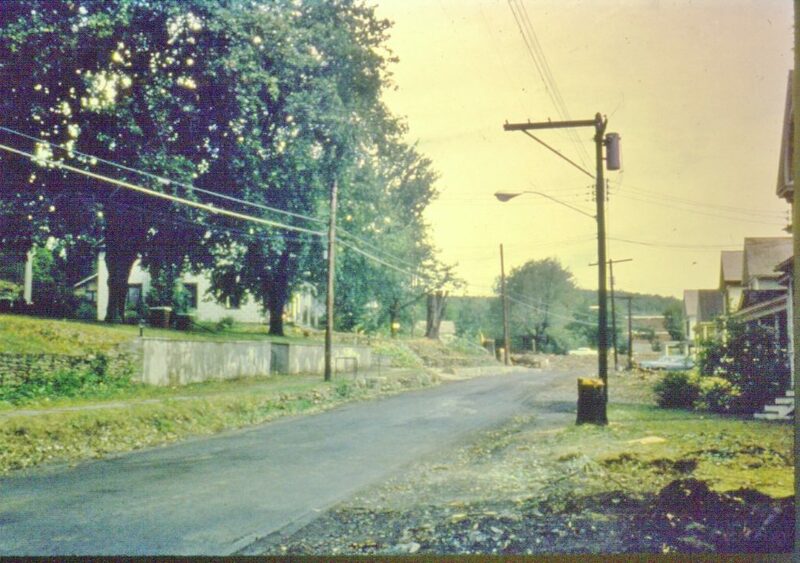 A view looking north on North Main Street after trees were removed. Looking south on North Main Street. Looking north on North Main Street. High School is in the background. Grenier's has not been moved yet. Same location as previous photo looking south. Same location a little further north. 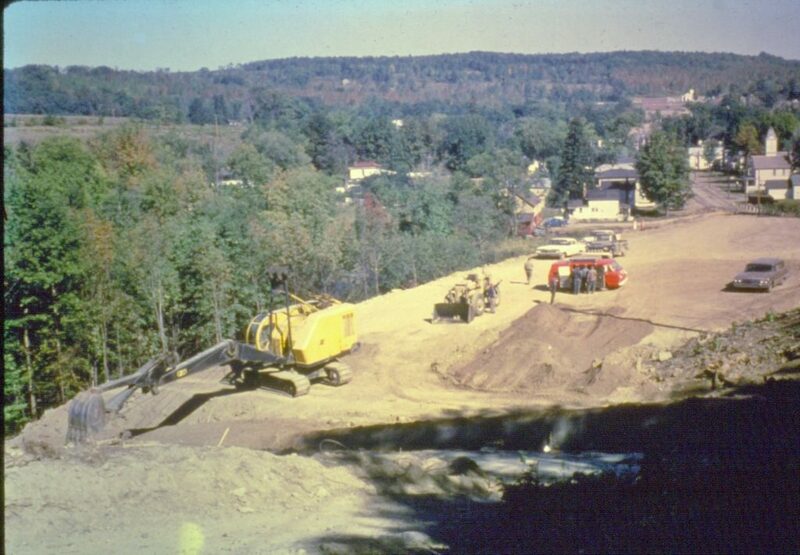 Looking south, North of the Village, the new road is taking shape. 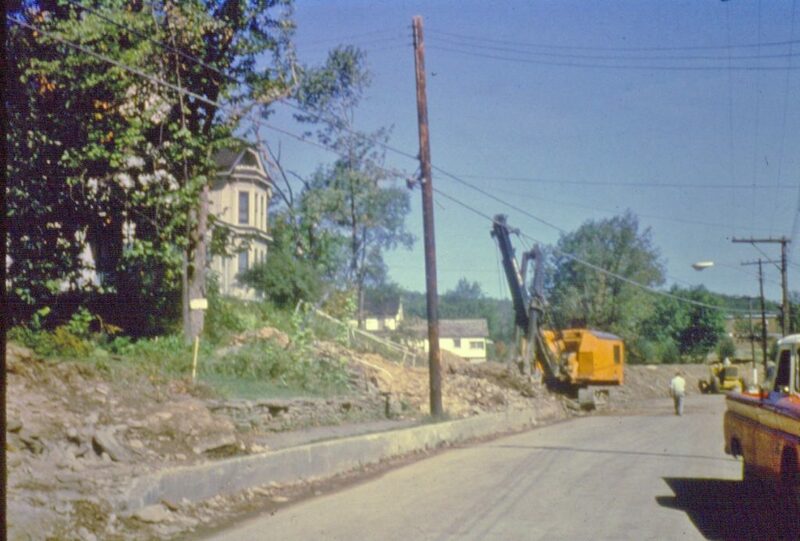 Grenier's house has been moved back and you see it on the right. 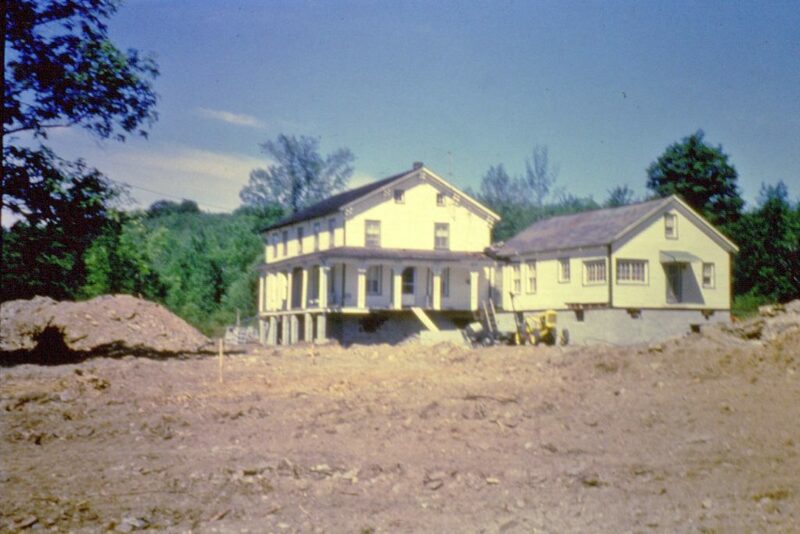 Grenier's House on new foundation. 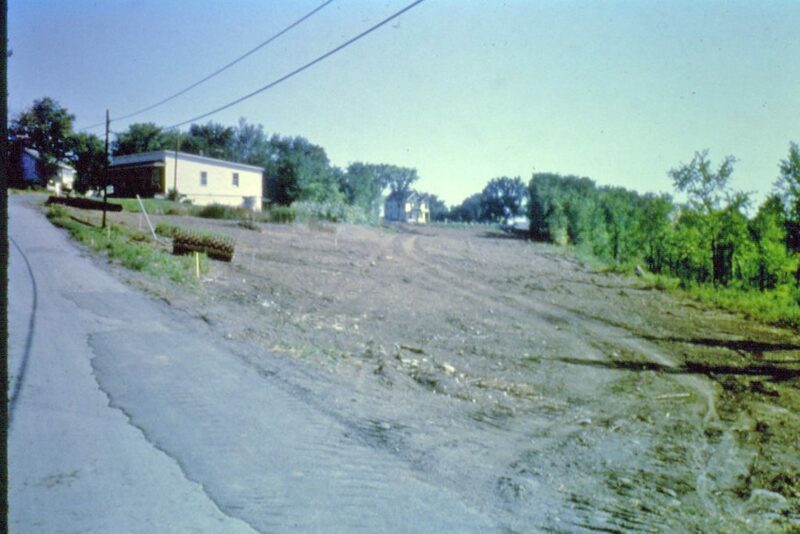 Grenier's House on new foundation from road. Looking Northeast on 395. 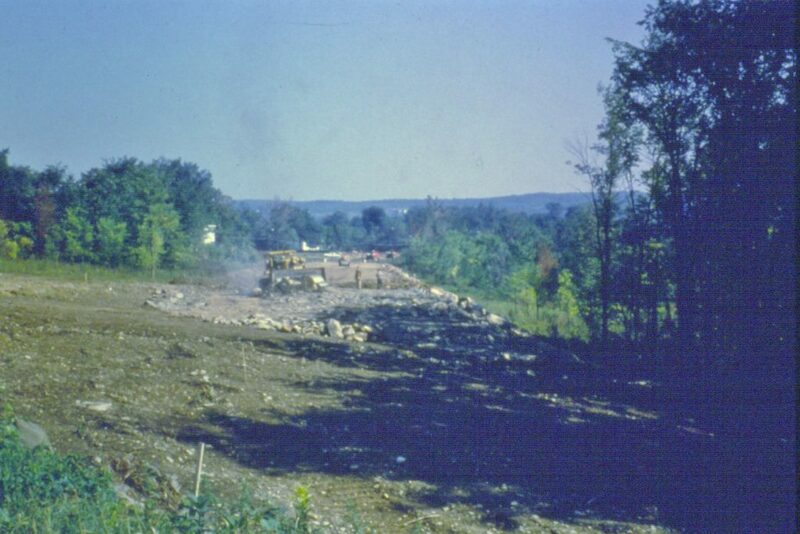 The future School Drive on the left. 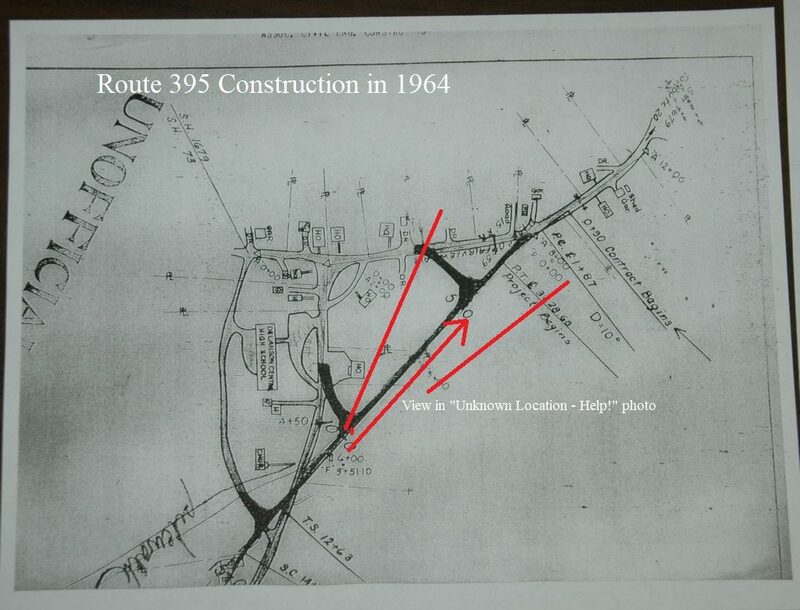 This section of 395 was created to bypass the high school. See next photo of map.